Have you ever wanted to see what natural movement really looks like? Watch a small child. If you have sons, daughters, nieces, nephews, etc, keep an eye on them. The problem for adults is that we have developed, over the years, compensatory patterns. Ways of moving that are not good, and contrary to the way that nature intended. The reason being is that we eventually come across something that we want to do that our body does not, so we figure a way around it. The issue that that develops is that you cannot out-wit nature. Your body only moves certain ways because that’s the way that nature intended it to move. If you watch your kids, you notice that they run up on their toes. Until we put them in shoes. They learn to throw underhand first (usually), since this is more nature and less destructive. They have perfect squats! Look at this picture. This kid has gotten it down. All the basic elements are there. And I’ve watched my kids play this way for 15-20 minutes at a time. I am completely jealous! If I still had that range of motion, I’d be all over it. And mine are better than many. I watch people squat every day and just DESTROY their bodies by adducting their knees, over-extending their quadriceps and completely neglecting the hip musculature. Bad, bad and more bad. 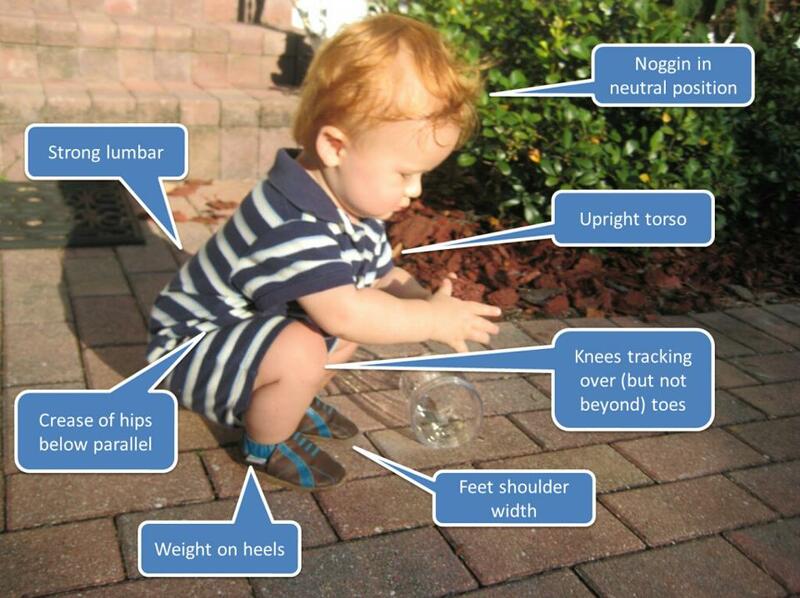 We want to teach lifters to move like children. Free of compensation. Kids don’t compensate because they don’t know any better. If something doesn’t work, they simply just don’t do it, because the alternative typically hurts. Until they learn to compensate. We teach them bad movements by enforcing bad movement patterns. And that good movement that they knew simply gets overwritten in their brain. From there, it’s hard to re-write it the proper way. So teach them properly from day one. Encourage natural and varied movement. You could learn a lot from your kids!